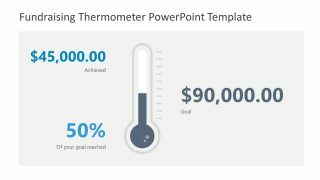 The Fundraising Thermometer PowerPoint Template is a presentation tool for nonprofit organizations. The thermometer layout of slides can help organizations to keep track of donations received by other corporate bodies or individuals. This fundraising PowerPoint has four slides, containing thermometer PowerPoint shape versions. For example, the first three slides display different temperature levels on thermometer as percentage of amount achieved. 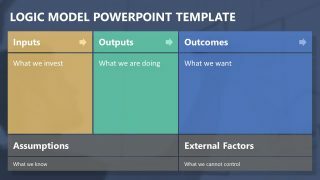 These slides also show the donation goal in bold. However, the last slide presents a horizontal timeline style thermometer with textboxes neatly organized in columns. 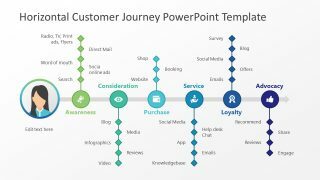 The users can copy desired layout into a fund-raising presentation and highlight collective amount. 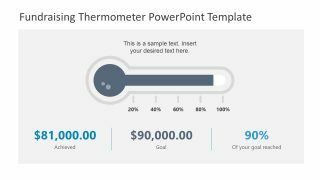 It is an editable PowerPoint template where mercury in thermometer clipart illustrates received amount’s percentage. The users can change mercury levels by simply dragging a bar to display new achievement levels. Hence, any company can set up charity goals and keep track of total amount vs. the objectives. 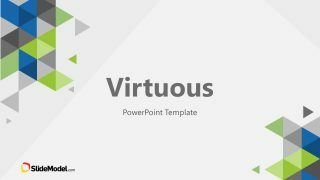 This fundraising PowerPoint template is useful during charity event. However, users can add this layout to an organization’s website and social media for maximum reach and accessibility. Because editable thermometer makes it easier to collaborate in real time. 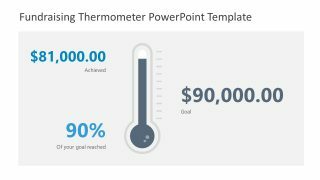 The Fundraising Thermometer PowerPoint Template gets viewers attention by breaking away from traditional spreadsheets and tables. 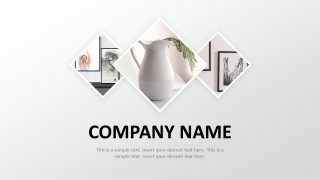 Any non-profit organization can benefit from this template by presenting a fund-raising event or campaign. As charitable organizations depend on benefaction for cost incur by members who work together for a cause.